A new version of FREE BEER that will be displayed at the gallery Vermelho relies on a partnership with “Cervejaria Germânia”, which, besides producing the beverage adjusting the recipe to the Brazilian palate, will also distribute the product. 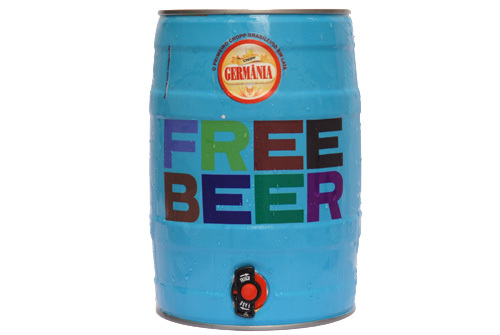 The association between Germânia and FREE BEER meets one of the prime objectives of the project, since it builds an open business, which, starting from a real product, questions the copyright system, in relation to intellectual property. The FREE BEER will also be featured in the exhibition by a series of machines – “Counter-game strategies”. In a game format, the machines, whose rules will be displayed next to them, simulate the fashion of the social economic system, with its production and distribution, competitiveness, collaboration, earnings and profit. These machines will be spread around the gallery and visitors will be able to handle them freely. PERIOD:: from November 28th to December 22nd, 2007. CHAT WITH THE ARTISTS and RONAL LEMOS, and FREE BEER PUB QUIZ:: December 1st, from 4 to 8 p.m.
WORKSHOP “THE WOLRD OF BEER” WITH CILENE SAORIN and ARNALDO RIBEIRO:: December 15th from 2 to 5 p.m. OPENING HOURS:: from Tuesday to Friday, from 10 a.m. to 7 p.m. and on Saturdays from 11 a.m. to 5 p.m.